The eyes are the focal pointe of the face and one of the first places we start to age. A professional chemical peel to treat the skin around the eyes, may be just what the doctor ordered. A Medium Depth Peel will..
– Treat skin laxity, fine lines, “stretchable” wrinkles and scars. The skin around the eyes is thin and with age begins to show fine lines and take on a crepey texture. Treating the delicate skin around the eye can be tricky. Lasers can damage the eye, so this limits how we treat this area. 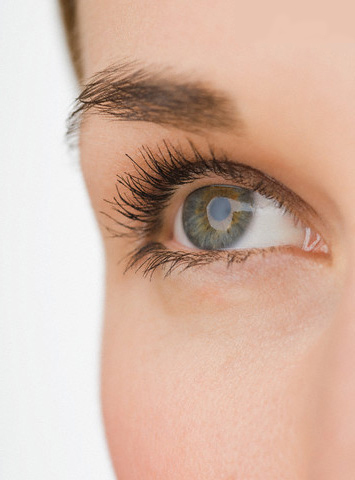 Laser resurfacing can be done, if special laser eye shields are placed inside the eye. Chemical peels are another option for treating the skin around the eye, and when done by a skilled professional can be done up to the lash line. Chemical peels that penetrate to the appropriate depth in the skin, can improve texture and tighten skin. A TCA peel that penetrates beyond the papillary dermis, just to the Immediate Reticular Dermis (IRD) will provide skin tightening effect, this is called a Medium Depth Peel. I am choosing not to mention the strength of TCA used, because I read too many horror stories online about people who attempted to do a professional peel at home. Skin care professionals are trained on how to determine where we are working in the skin, this is a medical grade peel and should be done by an experienced professional. Skin care professionals often talk about “skin cell turn over”. Skin cell turnover is the process of a new skin cell being produced, working it’s way up to the surface and replacing old skin cells which have been sloughed away. In young healthy skin this process takes about 6 weeks, however aging and sun damage slow this process. Chemical peels increase skin cell turnover, which in turn improves skin texture. The production of growth factors, collagen, elastin and hylaraunic acid all slow with age, so the goal in anti-aging is to preserve and increase the production all of these things. Collagen is a protein that gives skin it’s volume strength and structure, while elastin is what gives skin it’s elasticity or ability to snap back. Hyaluronic acid is a key molecule involved in skin moisture, as it binds and retains water. Hyaluronic acid is also needed to bind collagen to elastin. When we do chemical peels and laser treatments that penetrate beyond the skins epidermis, we are benefitting from the skins own wound healing ability to up regulate growth factors and stimulate the production of collagen, elastin and hyluranic acid. The result is a thicker dermis, smoother surface and skin tightening. The day of the peel is considered day 1. On days 1 and 2 your skin looks okay, but it may look dry and slightly older. By day 3 skin begins to look dark or bronze, this will vary depending on your natural skin color, skin discolorations and depth of peel. Skin usually begins to peel on day 4 and is usually done by day 5. After the skin has peeled of it may be pink for a couple days. The healing process does vary for each person. Healthy skin will always recover more quickly with less inflammation. During the peeling process you will need to follow the post peel instructions given to you by your skin care professional. This usually includes using a gentle cleanser, a hydrocortisone cream and mild moisturizer. An occlusive ointment such as Vasoline or Aquaphor may be recommended. It is VERY important to not pick or pull off the skin, let it peel in its own time! (seriously… don’t do it) You should also avoid sweating during the pealing phase, because it will create sweat beads under the skin that will cause it to peel of prematurely and thats bad. The skin should be protected with a totally physical sunscreen, I like Physical Eye UV Defense SPF 50 by Skin Ceuticals. After the old skin has peeled off, it instantly looks and feels smother. The collagen production will continue to increase and the skin will continue to feel tighter. To keep the skin renewal process un regulated and functioning more similar to young skin, I usually recommend having around 4 TCA chemical peels around the eye area per year. Treatments should be scheduled over 6 weeks apart. This entry was posted on Thursday, June 5th, 2014 at 9:35 pm	and is filed under Anti-aging, Chemical Peels, Eyes. You can follow any responses to this entry through the RSS 2.0 feed. You can leave a response, or trackback from your own site. Tighten The Skin Around Your Eyes « BestOfBothWorldsAZ.com < Loved it! Hi to all, the contents existing at this web page are in fact remarkable for people knowledge, well, keep up the good work fellows. a co-worker who was doing a little homework on this. the time to discuss this issue here on your web page. Thanks for finally talking about > Youthful Eyes: The Chemical Peel to Tighten The Skin Around Your Eyes « BestOfBothWorldsAZ.com < Liked it! Thanks for finally writing about > Youthful Eyes: The Chemical Peel to Tighten The Skin Around Your Eyes « BestOfBothWorldsAZ.com < Liked it! We specialize in UNIQUE GADGETS for every family member. We travel all over the world to bring to your door the coolest gift ever!! !